Over the past three decades, more than one thousand pink diamonds from Rio Tinto’s Argyle mine in Western Australia have been offered for sale at annual invitation-only events known as tenders. These diamonds, selected from the mine’s large annual production of rough, are cut and polished at the company’s factory in Perth for the tenders. These diamonds have all been graded by GIA, as their color grade is a crucial value consideration. This article summarizes each year’s collection and presents some pertinent statistical information on color grade and description for this important group of rare colored diamonds. Diamonds are among the rarest and most valuable of all gems. Those exhibiting noticeable color are rarer still. It is estimated that they make up just 0.01% of the world’s total production (King, 2006). Such diamonds have been celebrated throughout history as defining treasures of nobility and prized possessions of the wealthy. Of all the colors, pink diamonds are among the most alluring and sought after. For much of history they were recovered only sporadically in India, Brazil, Indonesia, and southern Africa (King et al., 2002). Even rarer was the recovery of diamonds described as red or predominantly red, of which only a handful have ever been documented (Shigley and Fritsch, 1993; Wilson, 2014). The situation changed dramatically in the mid-1980s with the emergence of the Argyle mine, located in a remote region of Western Australia (Smith, 1996; Shigley et al., 2001). Argyle Diamonds Ltd. was formed by the parent company CRA Ltd., later Rio Tinto Ltd., to develop the mine and market the product. This mine became one of the world’s largest sources of diamonds (Bevan and Downes, 2004), including a small production of valuable pink to red stones (figure 1). This limited but consistent supply has intensified interest in these colored diamonds. Figure 1. 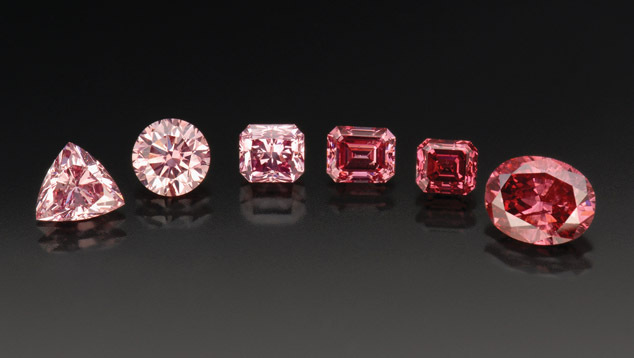 A selection of Argyle pink diamonds from the 2007 tender shows a range of color depth. The weights range from 0.66 to 1.74 ct. Photo by Robert Weldon/GIA. The late 1970s and 1980s were a pivotal time in the world of colored diamonds. Through a confluence of events—including the Argyle mine coming on line—colored diamonds gained much greater publicity and desirability than ever before. The late 1970s witnessed a period of unprecedented experimentation in diamond cutting. This proved beneficial to colored diamonds, as many of the proportion sets that were developed served to maximize face-up color appearance. Auction sales and museum exhibitions also drove interest, drawing widespread media coverage. For example, Christie’s New York sold the Hancock Red for almost US$1 million per carat in 1987. Andre Gumuchian’s Spectrum Collection and Eddy Elzas’s Rainbow Collection were also shown at the American Museum of Natural History in New York during these years. With its high yield of colored diamonds, Argyle joined in this mix of activity by developing innovative advertising and marketing campaigns. These efforts, while bringing attention to their brown “champagne” and “cognac” as well as rare pink diamonds, also heightened awareness of colored diamonds overall. The Argyle mine (figure 2) is in the East Kimberley region of Western Australia, 500 km (340 mi) southwest of Darwin and more than 2,200 km (1,400 mi) northeast of Perth. Systematic exploration began in 1969, following the discovery of a few alluvial diamonds in the area, but another decade of careful fieldwork passed before geologists recognized the host rock as a diamond-bearing lamproite pipe (Chapman et al., 1996). 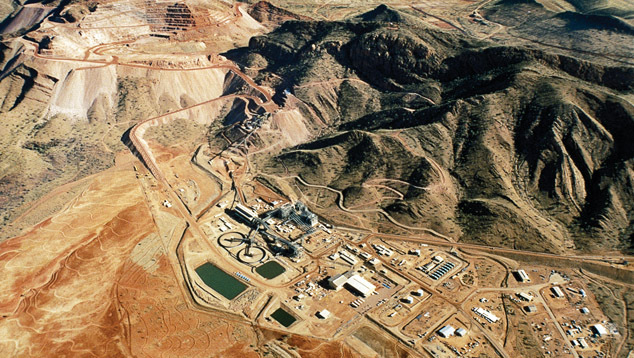 Several more years were required to develop the site, and the mine became fully operational in late 1985 (Shigley et al., 2001). Over the next 25 years, mining was carried out from a large open pit. In the early years of the 21st century, recognition of the finite economic lifetime of this open pit led to feasibility studies of underground mining operations, which began in 2013 (figure 3). Figure 2. In this early photo of Rio Tinto’s Argyle mine in Western Australia, taken in the late 1980s, the production plant is seen in the center and the open-pit mine in the upper left. Photo by James Lucey/GIA. Figure 3. 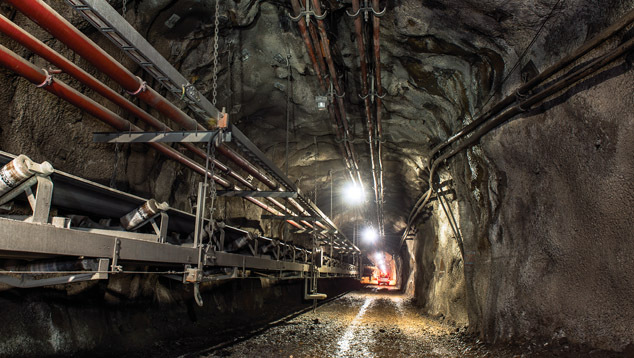 A recent view of underground operations at the Argyle mine, where 40 kilometers of tunneling have been built to access the diamond-bearing lamproite ore. Photo courtesy of Rio Tinto. This decision is expected to extend the life of the mine until at least 2020, with expected production of up to 20 million carats per year over the life of the underground mine. The output is dominated by near-colorless to brown diamonds, but from the beginning there has been a small but consistent supply of pinks, comprising less than 0.1% of the mine’s total annual production. This deposit now supplies more than 90% of the pink diamonds in the marketplace, and no other source is known to produce these goods in quantity on a regular basis. The autumn of 2014 marked the 30th Argyle pink diamond tender. Each year has witnessed increasing participation and competition among diamantaires for invitations to the tender and the opportunity to place sealed bids on these select goods. 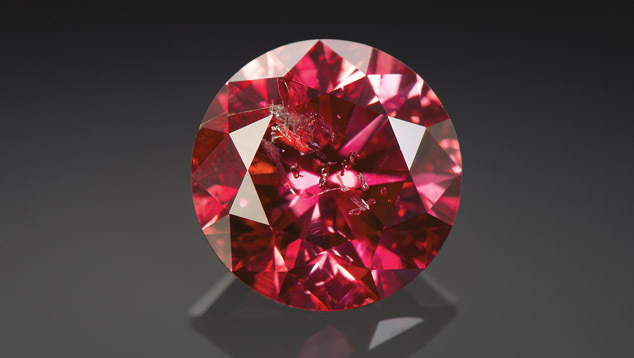 While most of the diamonds tendered over the years have been pink and purplish pink, a few reds (and even other colors such as blue, violet, orange, and yellow) are occasionally offered. The first tender, consisting of 33 diamonds, took place in Antwerp in 1985. The following year, Geneva was added as a viewing venue. As interest in these events has grown, previews have been held in New York, Hong Kong, London, Perth, and Tokyo. The number of venues continues to change over the years, as does the number of diamonds on view—some tenders have included 70 or more. The rarity of the items selected for these events is readily apparent from Argyle’s estimate that for every half million carats of rough produced, only one carat is suitable for tender. Argyle’s tender process only adds to the excitement that surrounds these diamonds. The tender is by invitation only, and the list of invitees is not made public. Those invited to bid are provided limited-edition catalogs highlighting key information on each diamond. While they have ample time to review the data from the catalog, an invitation to view allows a time slot of approximately one hour in which to make bidding decisions. Despite this time constraint, the participants are seasoned professionals who know the range of pink diamond color appearances and how they relate to value. In any given city, the site remains unknown until just before the viewings. When setting up to show 30 to 80 pink diamonds in one location, security is crucial. Upon arrival, the observer finds the diamonds displayed in small individual cases with clear fronts (figure 4). Weight and color grade are noted on each case. Loupe and tweezers are supplied, but many diamantaires bring their own. In some instances, they bring samples for comparison. As is typical in many diamond offices, white paper desk pads are in place, and desk lamps with fluorescent lights are available as well as daylight. While this arrangement does not represent the standard used in a laboratory, most dealers are comfortable with it as it resembles their own office conditions. Figure 4. GIA’s John King and Tom Moses (left) join David Fardon of Rio Tinto in examining the 1998 Argyle tender in New York. Following the viewing, participants make decisions about individual stones or, in some instances, the entire lot. Argyle does not publish the winning bidders or final prices; when reported in the press, it is at the discretion of the buyer. While GIA has graded all the tender stones, the refinement of its color grading system for colored diamonds in 1995 (see King et al., 1994) allowed a more detailed, boundary-distinct color language for these pink diamonds than ever before. With the addition of grades such as Fancy Deep, Fancy Intense, and Fancy Vivid, the tender diamonds were better recognized for their uniqueness and rich color appearances. Interest in Argyle pink diamonds certainly expands beyond the activity surrounding tenders. Over the past five years, GIA’s laboratory has produced custom monograph reports for exceptional diamonds, colored gemstones, pearls, and jewelry pieces. One such monograph was created in 2010 for the Majestic Pink Diamond Bracelet. The bracelet’s 204 pink diamonds, though not tender stones, did come from the Argyle mine. In recent years, notable “hero” stones from the tender have been named. In 2013 a GIA monograph was created for such a diamond, the Argyle Phoenix, a 1.56 ct Fancy red (figure 5). Figure 5. The Argyle Phoenix, a 1.56 ct Fancy red round brilliant diamond, was a highlight of the 2013 tender. Photo by Josh Balduf/GIA. Over the years, several authors have described the gemological characteristics of pink diamonds from the Argyle mine, including Hofer (1985), Chapman et al. (1996), Deljanin et al. (2008), and Rolandi et al. (2008). Shigley et al. (1990) detailed the quantity and quality of diamonds discovered in Western Australia during the mine’s first five years of operation. Particularly noted was the Argyle mine’s dramatic impact on the world market: In 1986, one year after the mine became fully operational, Australia was the largest source of diamonds. The summaries noted below are based on Argyle press materials highlighting the first 13 tenders (1985 to 1997) as well as annual tender catalogs produced by the company from 1995 to 2014. Tender diamonds have encompassed a wide range of color depths, as well as colors other than pink (figure 6). Note that throughout this article, the term pink is applied broadly to the entire color range of pink diamonds. This includes stones with brown, purple, or orange modifying components. In each of these instances, however, the predominant color appearance is pink. Figure 6. 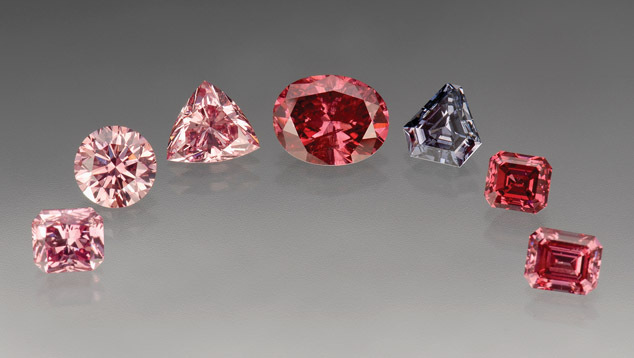 Highlights from the 2007 tender include (left to right) a 0.66 ct Fancy Vivid purplish pink cut-cornered rectangular modified brilliant, a 1.02 ct Fancy Intense pink round brilliant, a 0.91 ct Fancy Intense purplish pink triangular brilliant, a 1.74 ct Fancy purplish red oval brilliant, a 0.77 ct Fancy Dark gray-violet shield cut, a 0.69 ct Fancy purplish red emerald cut, and a 1.22 ct Fancy Vivid purplish pink emerald cut. Photo by Robert Weldon/GIA. 1985: The inaugural tender offered 33 diamonds with a total weight of 18.03 carats. Never had such a large group of pink diamonds been assembled for sale, a noteworthy preview of things to come. 1986: This collection of 56 stones totaling 32 carats was divided into two groups: 12 diamonds of fine color and 44 lower-quality pink and brownish pink diamonds. Two gems in particular stood out. One of them, a 0.52 ct emerald cut, was noted to be the finest purple-pink diamond Argyle had ever offered. The other, a 2.11 ct cushion cut, was said to be remarkable not only for its size but also its deep color and fine VS clarity. According to Argyle, the prices achieved at this sale were thought to be strong, considering this was only the second tender. 1987: With 83 diamonds weighing a combined 59.65 carats, this tender nearly doubled the total weight from the preceding year. The overall quality of the goods was also markedly improved. One memorable 0.50 ct diamond appeared to be so saturated that it bordered on red, eclipsing all other Argyle pink diamonds seen up to that point. 1988: The fourth tender set new standards for size, color, and quality, featuring 53 diamonds with a combined weight of 64.08 carats. The average stone size was 7% larger, including 26 diamonds over one carat and three diamonds over two carats. Highly saturated colors were also found in a 0.66 ct diamond and a 1.00 ct round. In April 1989, a separate auction of Argyle pink diamonds was held at Christie’s New York. Argyle chose this method of sale—a first for a mine—hoping to reach a new audience of private buyers. The auction featured 16 unmounted pink diamonds ranging from 0.41 to 3.14 ct. At this time, the “end grade” for pinks in GIA’s system was Fancy. Therefore, diamonds with the greatest depth of color were all described as Fancy, with others noted as Light or Fancy Light. Color descriptions included pink, purplish pink, brownish pink, brown-pink, and pink-brown. 1990: In the first tender of the 1990s, 36 diamonds totaling 40.93 carats were offered. The average weight remained above one carat, but this tender was a departure from previous years in that no stones over two carats were offered. Nevertheless, record bids for this smaller collection reflected the continued emphasis on quality. 1991: The seventh tender consisted of 47 gems weighing a total of 40.15 carats: 43 pinks, three blues, and one Fancy grayish greenish yellow diamond. The entire collection was sold to a single buyer, Robert Mouawad of Geneva. 1992: The 1992 tender began with a preview in Tokyo. Fifty diamonds with a total weight of 43.39 carats were offered for sale. A record number of bidders demonstrated the continuing demand for Argyle’s unique diamonds. Winning bids went to 15 clients from countries including the United States, the UK, Belgium, Switzerland, Japan, and Italy. 1993: Strong competition characterized this tender, which saw the entire collection sold again to Robert Mouawad. This time, Mouawad announced that he paid more than US$2.25 million to purchase the 46-diamond selection, totaling 41.48 carats. 1994: The entire collection of 47 diamonds, weighing a total of 45.17 carats, was sold to an international consortium. Argyle reported that the per-carat price surpassed that of all previous tenders but did not disclose the amount of the sale. More than 35% of the 1994 tender diamonds were above one carat. These included two Fancy pink diamonds weighing more than three carats, a 3.00 ct round brilliant and a 3.04 ct emerald cut. For the first time, the tender collection was viewed in Hong Kong and Singapore. 1995: This tender featured the most pink diamonds over one carat since 1990. Its 47 diamonds weighing 45.22 carats total brought more than US$4.5 million, over US$100,000 per carat. Seven fancy-color diamond dealers from Asia and Europe purchased the collection. Showings in Tokyo, Hong Kong, and Geneva brought unprecedented levels of publicity to the tender, and 17 leading dealers and jewelers placed more than 180 bids for individual diamonds. Noted highlights included a 1.05 ct Fancy Deep purplish pink round brilliant and three heart shapes weighing 0.70, 0.75, and 0.90 ct, as well as the collection’s largest diamond, a 2.80 ct Fancy Deep pink emerald cut. 1996: Two new venues were added this year: Perth and London. The 47.82 carat collection of 47 stones featured the largest polished pink diamond ever tendered by Argyle up to that point, a 3.66 ct Fancy Intense pink-purple cushion cut. The second-largest diamond at this tender was a 3.06 ct Fancy Intense pink emerald cut. Prior to 1996, only six pink diamonds in the three-carat-plus category had ever been offered by Argyle. 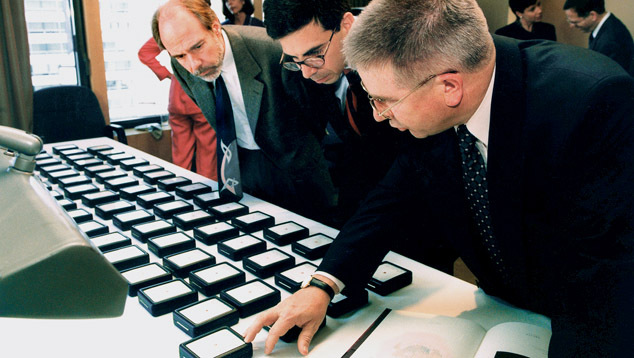 1997: Featuring 59 diamonds totaling 58.64 carats, the 1997 tender set a new record for total sale price. Although Argyle also reported a new record per-carat price for the 55 pink diamonds offered, neither figure was made public. Almost half the diamonds (27) were one carat or larger. The most outstanding offering was a 1.78 ct oval, the largest Fancy purplish red diamond ever graded by GIA at the time. Other significant stones were a 1.41 ct Fancy Intense purple-pink emerald cut with VVS clarity (pinks with such high clarity grades are extremely rare), a 1.01 ct Fancy Deep pink round brilliant, and a 2.82 ct Fancy Intense purplish pink round brilliant (the tender’s largest diamond). A viewing was conducted in Sydney for the first time, in response to growing demand for fancy-color diamonds in the Australian market. Figure 7. Two important diamonds from the 2007 tender were a 1.74 ct Fancy purplish red oval brilliant and a 0.77 ct Fancy Dark gray-violet shield cut. Photo by Robert Weldon/GIA. 1998: This year saw the introduction of New York as a viewing location. This edition included 63 diamonds, ranging from 0.44 to 3.15 ct, with a total weight of 58.20 carats. Lot 62, a 2.66 ct heart-shaped diamond, truly captured the soul of the tender with its Fancy Vivid purplish pink hue. Almost a quarter of the diamonds received a Fancy Vivid classification from GIA, the most since the revision of the fancy-color grading system in 1995. 1999: For the 15th tender, 51 diamonds with a total weight of 52.61 carats were presented, in sizes ranging from 0.50 to 2.76 ct. A highlight of this tender was its largest diamond, a stunning 2.76 ct Fancy Intense purplish pink oval brilliant. This sale also included the first Argyle diamond graded by GIA as Fancy red, a 0.73 ct emerald cut. 2000: To start the new millennium, Argyle assembled 47 diamonds totaling 46.43 carats. With a size range from 0.50 to 2.10 ct, the tender included 22 diamonds of at least one carat. Five of the diamonds were Fancy Vivid; the two largest of these, both graded as Fancy Vivid purplish pink, were a 1.66 ct oval and a 1.75 ct princess cut. 2001: Of the 41 diamonds featured, 17 were larger than one carat. One highlight of the tender was an impressive 4.15 ct Fancy Intense purplish pink radiant, the first stone over four carats to appear in an Argyle tender. The collection had a total weight of 41.92 carats. 2002: Of the 43 diamonds offered at this tender, nearly half were graded by GIA as either Fancy Vivid purplish pink or Fancy Intense purplish pink, with an additional three Fancy purplish reds. The colors represented an impressive palette, ranging from Fancy Vivid purplish pink to Fancy Deep gray-violet. Two highlights of this tender were a magnificent 2.14 ct round brilliant Fancy Intense purplish pink and a rare Fancy purplish red 1.00 ct oval. The total weight of the lots was 40.13 carats, with sizes ranging from 0.40 to 2.52 ct.
2003: This stunning collection was comprised of 48 pink diamonds weighing a total of 45.60 carats. Two of these are considered among the finest from any tender: a 2.06 ct round brilliant graded as Fancy Vivid purplish pink and a 2.04 ct radiant graded as Fancy Vivid purple-pink. This tender, with sizes ranging from 0.49 to 2.07 ct, also featured the second-ever Fancy red diamond, a 0.54 ct oval. 2004: For the 20th edition, Argyle unveiled an impressive selection of 60 pink diamonds totaling 55.53 carats. This sale featured an extraordinarily rare 1.00 ct Fancy red radiant-cut diamond, only the third Fancy red ever tendered. There were four stones larger than two carats, most notably a 2.31 ct Fancy Vivid purplish pink cushion cut. The collection also featured two diamonds graded as Fancy purplish red: a 0.52 ct lozenge cut and a 0.69 ct emerald cut. 2005: With 60 diamonds totaling 58.81 carats, this collection featured an extraordinary number of red hues, as well as nine diamonds designated as Fancy Vivid. There were also 27 diamonds larger than one carat, and four greater than two carats. Another notable event that year was the formal registering of the Argyle Participation Agreement, signed by both Argyle and the traditional owners of the land. This agreement acknowledged the indigenous owners as the mining lease custodians, recognizing Argyle’s right to mine while also laying the foundation for a shared commitment to employment, education, and business development in East Kimberley. 2006: This tender featured the largest gathering of pink diamonds in well over a decade, consisting of 65 diamonds weighing a total of 61.43 carats. Thirteen received the Fancy Vivid color grade. Rounding out this splendid collection were three radiant cuts, each weighing exactly 2.03 ct, graded as Fancy Deep pink, Fancy Intense pink, and Fancy Intense purplish pink. Also in 2006, Argyle announced that an underground mine would be constructed below the existing open pit. At the time it was estimated that underground operations would extend the life of the mine to 2018. 2007: The 2007 tender was viewed in only three locations: Perth, Hong Kong, and New York, half the number of venues seen in the previous three years. Many of the 65 stones had a deeper, more vivid color than in years before. With 62.20 carats total, the tender offered several highlights, including a rare Fancy Dark gray-violet diamond, a 0.77 ct shield cut (figure 7). The selection also featured 22 stones with a Fancy Deep grade and 15 others graded as Fancy Vivid. Other featured diamonds included a 1.51 ct octagonal Fancy Deep pink, an octagonal 2.02 ct Fancy Deep pink, and a 1.74 ct oval-shaped Fancy purplish red (again, see figure 7). 2008: This tender was comprised of 64 lots weighing a total of 62.46 carats. It included a number of highly sought-after rounds and two notable diamonds: a 1.01 ct round Fancy purplish red (the Argyle Aphrodite) and a 1.41 ct Fancy Deep gray-violet octagon (the Argyle Ocean Seer). For the first time in seven years, the collection also included a heart-shaped diamond, a 1.33 ct Fancy Intense purplish pink. 2009: Titled “Grand Passions,” the 25th tender comprised 43 stones and a total weight of 34.74 carats. One of the four hearts offered, a 2.61 ct Fancy Intense pink, was the most valuable heart-shaped pink diamond ever to come from the Argyle mine. Exuding passion, romance, and warmth, it was named the Argyle Amour. Also highlighted were the Argyle Shalimar, a 1.25 ct Fancy Vivid purplish pink round, and the Argyle Scarlett, a 1.10 ct Fancy red oval. For this tender, Argyle produced a magnificent two-volume oversized catalog. The first volume showed all 43 stones, while the second gave background on the Argyle mine and its pink diamonds, including many beautiful illustrations. The collection also had its first-ever viewing in India. Mumbai had established itself as the manufacturing center for champagne-colored Argyle diamonds, and the tenders had seen an enthusiastic response from Indian diamantaires. 2010: Showcased for the first time in mainland China (Shanghai and Beijing), the 2010 “Earth Magic” tender comprised 55 diamonds totaling 46.42 carats. A 2.02 ct round Fancy Vivid purplish pink named the Argyle Mystra intrigued bidders with its depth of color. Argyle used the move into new tender locations to educate potential collectors through its publication of Rare and Collectable. This book, which accompanied the tender catalog and was distributed through authorized partners, examined the rarity of Argyle pink diamonds relative to global supply, capturing their allure and value. 2011: This year’s theme was hearts and flowers. For the first time, a matching suite of stones was presented. As each Argyle diamond is unique, a trio of matching colors is exceptionally rare. The Argyle Semper Suite, consisting of three Fancy Intense pink heart-shaped diamonds (0.58, 0.60, and 1.31 ct) was rarer still. Also shown was the Argyle Alanya, a 1.06 ct Fancy Vivid purplish pink oval named after one of the world’s rarest tulip species. Fifty-five diamonds appeared in the 2011 tender, with a total weight of 47.61 carats. 2012: Inspired by Queen Elizabeth II’s Diamond Jubilee, Argyle showcased its 2012 collection in a unique exhibition at Kensington Palace in London. The queen’s association with pink diamonds dated back to 1947, when she and Prince Phillip were given a 54.5 ct rough pink crystal from the Williamson (or Mwadui) mine in Tanzania as a wedding present. The diamond, now known as the Williamson Pink, was cut in 1948 and set as a 23.6 ct round brilliant into a flower spray brooch by Cartier in 1953. Those attending the Kensington Palace exhibition were granted the unusual privilege of viewing a selection from this very private collection of rare stones. Of the 70 diamonds in the 2012 tender, which totaled 42.79 carats, 40 were on display in this special exhibition. A notable stone from the tender was the Argyle Siren, a 1.32 ct Fancy Vivid purplish pink square radiant cut. 2013: The 2013 tender was known as the “Red Edition” for its three Fancy reds weighing 0.20, 0.58, and 1.56 ct, all round brilliants. Sixty-four diamonds were showcased that year, ranging from 0.20 to 2.03 ct, with a total weight of 54.99 carats. Two significant records were broken. The Argyle Phoenix, a 1.56 ct Fancy red, brought in the highest per-carat price for any diamond from the mine. The Argyle Dauphine, a 2.51 ct Fancy Deep pink radiant cut, achieved the highest overall price paid for an Argyle diamond. According to Argyle, this was also a world record for a Fancy Deep pink tender diamond. Though plans for underground mining at Argyle had been announced in 2006, it did not start until April 2013. As underground mining became operational and testing was completed, the expected life of the mine was extended from its original estimate of 2018 to at least 2020. 2014: To celebrate the 30th tender, and in keeping with that year’s bird theme, a limited-edition set of diamond-encrusted feather pendants was created with over one carat of pavé-set Argyle pinks. The tender comprised 54 pink diamonds totaling 46.88 carats. The featured diamond of the collection was the 1.21 ct radiant-cut Fancy red Argyle Cardinal, named after the North American bird known for its bright color. This tender also included four red diamonds. To date, there have only been 13 red diamonds in the history of the tender. Two other exceptional diamonds were the Argyle Toki, a 1.59 ct Fancy Intense purplish pink emerald cut, and the Argyle Rosette, a 2.17 ct Fancy Intense purple-pink emerald cut. The 2014 sale achieved the highest average price per carat since the tender’s inception. As noted earlier, each of the pink diamonds tendered has been examined by GIA’s laboratory. But the 1995 modifications to GIA’s colored diamond color grading system (see King et al., 1994) added new classifications to better describe face-up color appearance. With this in mind, our analysis of the pink tender diamonds will focus on the years 1995 to 2014. During that time, 1,100 Argyle stones were sold by tender. Included in that number are very limited examples of color other than predominantly pink. For the purposes of our analysis, we will focus on the 1,065 diamonds described as predominantly pink (again, the term pink is used to describe the entire range of pink diamonds). Over the years, strong depth of color has become a trademark of the Argyle diamonds seen at tender. This is clear from the chart in figure 8, where the grades related to stronger depth of color—Fancy Intense, Fancy Deep, and Fancy Vivid—dominate. Figure 8. 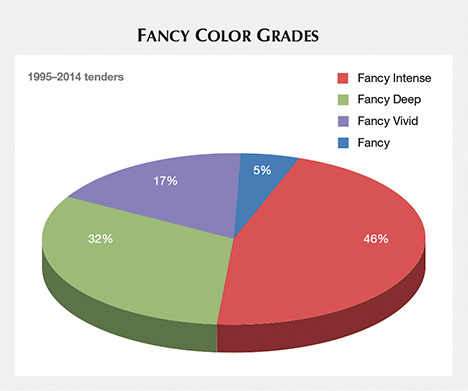 This chart shows the distribution of fancy color grades for the 1,065 pink diamonds from the 1995–2014 tenders. The vast majority (95%) had Fancy Deep, Fancy Intense, and Fancy Vivid color grades. To determine the color grade, the overall face-up color appearance is observed under controlled lighting and viewing conditions (King et al., 1994). The assigned grade is a combination of tone (the color’s lightness or darkness) and saturation (its strength or purity). Pink diamonds occur throughout the entire range of fancy grades, from pale colors associated with grades such as Faint, Very Light, and Light to the grades noted above for stronger colors. Red or purplish red diamonds are limited to the grade “Fancy” because they occur in a limited range of tone and saturation (King et al., 2002). In our analysis, the grade of “Fancy” represents the very small percentage of red or purplish red diamonds. Of the 1,065 pink diamonds selected for the tender from 1995 through 2014, 95% were graded as Fancy Intense, Fancy Vivid, and Fancy Deep (see figure 8). In the last five years, there has been a steady increase in the number of Fancy Intense color grades chosen, while the number of Fancy Vivids has fallen to levels seen in the first decade of the 2000s. Similarly, diamonds described as Fancy Deep represented 70% of the grades in 2000 but just 3% in 2014. Such shifts can occur for many reasons, including variations in the yearly mine output, cutting decisions to brighten or darken color near grade boundaries, or attempts to address current market trends in desirability. Figure 9 shows that the color descriptions chosen for tender diamonds have been quite consistent over the 20-year period. 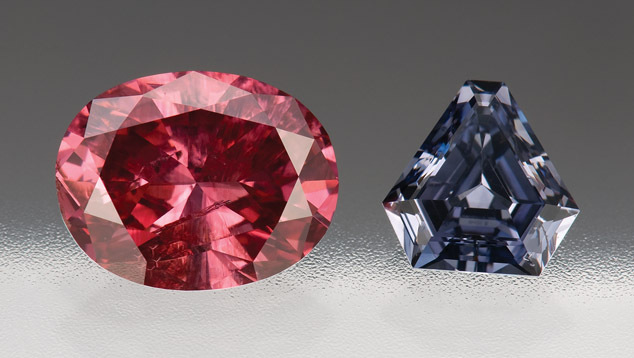 In GIA’s system, the color appearance of pink diamonds extends across six different hues, from pink-purple to pinkish orange (King et al., 2002). 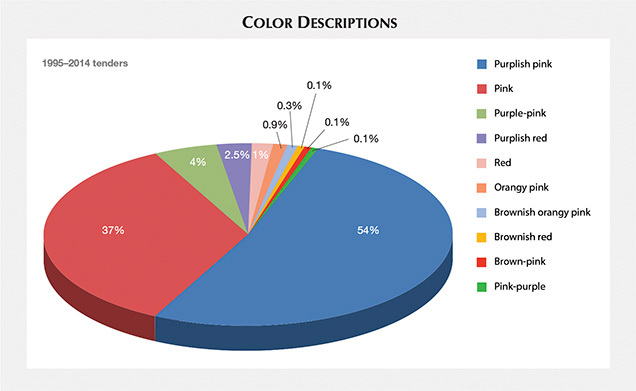 As shown in figure 9, the overwhelming majority of the 1,065 diamonds sampled (91%) occurred in a narrower range of hues: pink to purplish pink. Of this group of samples, 40 were described on grading reports as purplish red (27) or red (13). The largest of the red diamonds, the Argyle Phoenix, a 1.56 ct round brilliant, was included in the 2013 tender. Figure 9. While the tender diamonds displayed a range of color hues, the majority (91%) were described as having pink or purplish pink hues. A total of 1,065 diamonds were included in this analysis (excluding those with blue, violet, gray, green, and yellow colors). 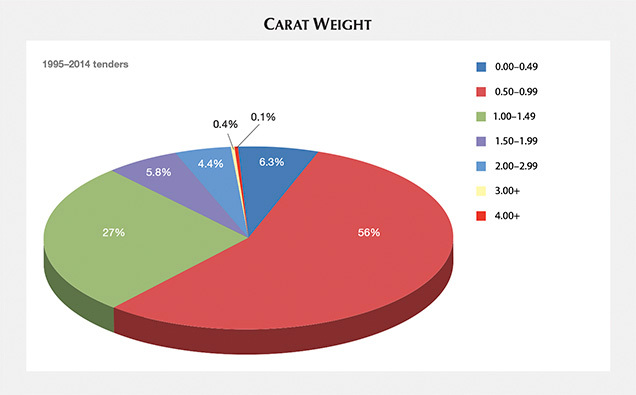 With regard to carat weight, figure 10 notes that 95% of the tender diamonds have weighed less than 2.00 ct, with the majority (56%) in the 0.50–0.99 ct range. The smallest weighed 0.20 ct, the largest 4.15 ct. Only 5% of this group weighed 2.00 ct or more. This faceted size range is typical of diamonds from the Argyle deposit. While larger rough pink diamonds have originated from kimberlites in India, Brazil, Indonesia, and southern Africa, it is unclear in geological terms why similar larger crystals do not occur here. Pink diamond crystals from Argyle tend to display irregular or strongly resorbed shapes (Chapman et al., 1996), and there is no indication that they represent broken cleavage pieces of larger crystals. Figure 10. Most of the tender diamonds (95%) weighed less than 2.00 ct, and 62% were less than 1.00 ct. The shape and cutting style descriptions of the Argyle diamonds from the 1995–2014 tenders are compared in figure 11. 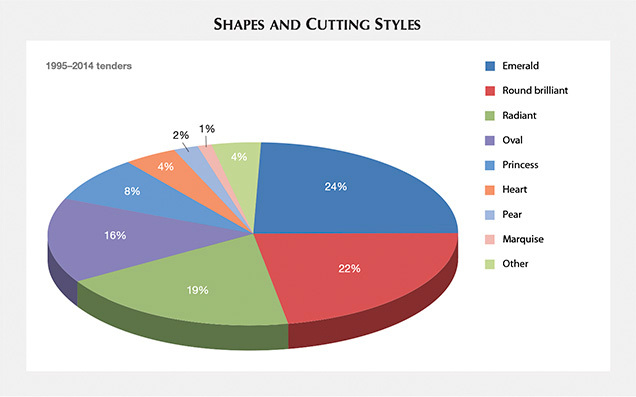 Four shapes—rectangular, round, square, and oval—account for 89% of the samples. The square and rectangular stones were most often cut as emerald cuts or cut-cornered modified brilliants (often referred to in the trade as “radiants”). While the step faceting of emerald cuts was the most common style, with round brilliants a close second, the other fancy shapes (square and rectangular modified brilliants and oval brilliants or modified brilliants) are often chosen by the manufacturer to maximize weight retention from the original crystal and accentuate the face-up color appearance. Figure 11. Argyle uses a combination of shape and cutting style descriptions in labeling diamonds for the tender catalogs. Most of the tender diamonds (89%) were rectangular, round, square, and oval. The overwhelming majority of stones are cut in the modified brilliant style, including all diamonds described as round, radiant, and princess. These cutting choices reflect the tremendous rarity of pink to red diamonds in that clarity grades have relatively little impact on their market value. With per-carat prices easily reaching US$100,000 or more based primarily on color, achieving high clarity is of less concern. Most pink to red diamonds seen in the Argyle tenders correspond to an SI to I clarity range. On the rare occasion that one is accompanied by high clarity, it is usually the talk of the tender, such as the exceptional 2.04 ct Fancy Vivid purple-pink radiant offered in 2003, which possessed VVS1 clarity. More recently, the 2014 tender featured a 0.51 ct round brilliant Fancy Intense pink diamond with VVS1 clarity. For centuries, pink diamonds have been cherished as true rarities of nature, and their great beauty has made them sought-after possessions. For the past 30 years, Australia’s Argyle mine has been the only consistent source of this gem material. Through Argyle’s effort to market these and other colored diamonds from the mine, the industry and public have gained much greater awareness of these fascinating gems. This article presented an overview of 30 years of tender diamonds, as well as a 20-year summary of their characteristics. As Argyle looks ahead to the 30th anniversary of its pink diamond tender, we are left to wonder about the course of future tenders with the shift to underground mining operations. How will pink diamonds’ desirability and value be shaped by an end-of-mining scenario in the near future? Such intriguing questions only add to the fascination that surrounds this unique product. John King is chief quality officer, and Claudia Jannucci is project manager of laboratory services, at GIA’s laboratory in New York. James Shigley is a Distinguished Research Fellow at GIA in Carlsbad. The authors wish to thank John Chapman, Josephine Johnson, and Robyn Ellison of Argyle Pink Diamonds for their comments and assistance on background information. Bevan A., Downes P. (2004) In the pink: Argyle’s diamond gift to Australia. Australian Gemmologist, Vol. 22, No. 4, pp. 150–155. Chapman J., Brown G., Sechos B. (1996) The typical gemmological characteristics of Argyle diamonds. Australian Gemmologist, Vol. 19, No. 8, pp. 339–346. Deljanin B., Simic D., Chapman J., Dobrinets I., Widemann A., DelRe N., Middleton T., Deljanin E., de Stefano A. (2008) Characterization of pink diamonds of different origin: Natural (Argyle, non-Argyle), irradiated and annealed, treated with multi-process, coated and synthetic. Diamond and Related Materials, Vol. 17, No. 7/10, pp. 1169–1178, http://dx.doi.org/10.1016/j.diamond.2008.03.014. Hofer S.C. (1985) Pink diamonds from Australia. G&G, Vol. 21, No. 3, pp. 147–155, http://dx.doi.org/10.5741/GEMS.21.3.147. King J.M., Ed. (2006) Colored Diamonds. Gemological Institute of America, Carlsbad, CA. King J.M., Moses T.M., Shigley J.E., Liu Y. (1994) Color grading of colored diamonds in the GIA Gem Trade Laboratory. G&G, Vol. 30, No. 4, pp. 220–242, http://dx.doi.org/10.5741/GEMS.30.4.220. King J.M., Shigley J.E., Guhin S.S., Gelb T.H., Hall M. (2002) Characterization and grading of natural-color pink diamonds. G&G, Vol. 38, No. 2, pp. 128–147, http://dx.doi.org/10.5741/GEMS.38.2.128. Rolandi V., Brajkovic A., Adamo I., Fontana I. (2008) Argyle type Ia pink diamonds. Australian Gemmologist, Vol. 23, No. 5, pp. 194–203. Shigley J.E., Chapman J., Ellison R.K. (2001) Discovery and mining of the Argyle diamond deposit, Australia. G&G, Vol. 37, No. 1, pp. 26–41, http://dx.doi.org/10.5741/GEMS.37.1.26. Shigley J.E., Dirlam D.M., Schmetzer K., Jobbins E.A. (1990) Gem localities of the 1980s. G&G, Vol. 26, No. 1, pp. 4–31, http://dx.doi.org/10.5741/GEMS.26.1.4. Shigley J.E., Fritsch E. (1993) A notable red-brown diamond. Journal of Gemmology, Vol. 23, No. 5, pp. 259–266. Smith R. (1996) Jewel of the Kimberley. Australian Geographic, No. 41 (January–March), pp. 88–107. Wilson W.E. (2014) Red diamond. Mineralogical Record, Vol. 45, No. 2, pp. 201–214.